Brayden McNabb and Deryk Engelland played a big role shutting down the Devils young, quick forwards. Golden Knights allowed less than 10 “High Danger” scoring chances for the first time in their last six games. 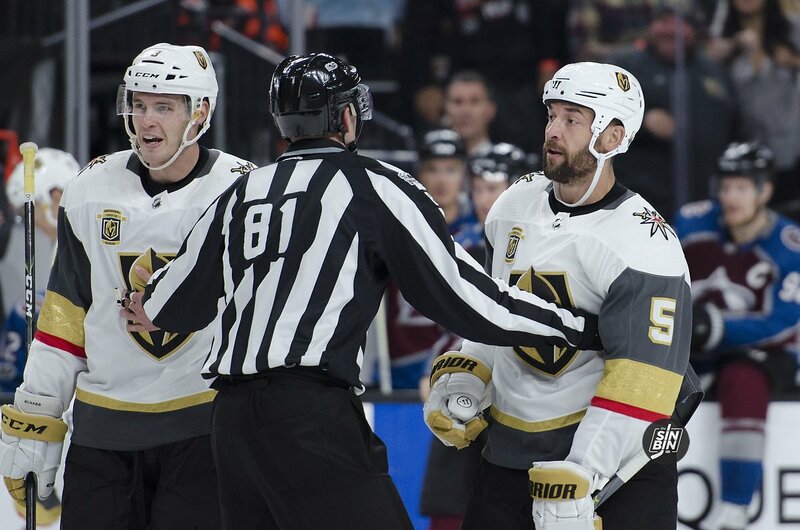 The victory ended the Golden Knights three-game skid. Along with eight other teams, Vegas hasn’t dropped four straight games this season. All eight teams are playoff contenders. Over his last three starts, Marc-Andre Fleury has seen 35 or more shots per game. The Devils were the ninth team to register at least 35 shots on goal against the Golden Knights, it’s the 17th time Fleury has faced 30+ shots this season, and ninth time since February 6th. All Star coach Gerrard Gallant has been trying to find the right mix of players with the rash of injuries the Golden Knights have been facing. He mixed up three forward lines and all three defensive pairs in New Jersey. Loving the lineup tonight from Turk. The lines produced mixed results. Hyka may have played his best game on the line with Perron and Haula, while Tatar looked a bit lost on the line with Eakin and Tuch. Reaves looked excellent forechecking and did very well in setting up one of the Golden Knights three goals, but he still looks a bit behind in transition. Defensively the end result was much better, just one even-strength goal allowed, but the Merrill/Hunt pairing struggled a bit, especially in their own end. With Merrill and Hunt on the ice, the Devils outshot the Golden Knights 10-2. However, one of those two shots went in the net (Perron’s goal). Participated in morning skate on the off-day in Columbus wearing a yellow practice jersey (indicating “fourth” line). He had been wearing the red “no contact” jersey every practice prior. Bellemare told the RJ’s Steve Carp that he hopes to return to the lineup tomorrow. Haula injured his arm in a collision during yesterday’s game in New Jersey. He did not participate in practice today. He is expected back in the lineup tomorrow. Were not on the flight to New Jersey to begin the trip. Have not joined the team in Columbus. Once again skated at City National Arena today. Still remains no timetable on his return. Bellemare back, who sits? Reaves or Hyka? When McNabb is hitting and playing his game, it tends to spark all the blue liners. It’ll be nice to have Carrier back, it’s going to be even better to see Bellmare. When 41 went down, we lost a lot of our gritty play. Reaves brings the best but he isn’t the player 28 or 41 is. With that being said, sit hyka. Id like to see a true heavy physical line 4. Hyka can also be sent to Chicago if needed. And since it’s technically an emergency recall, he may mandatorily be sent down.